On an urgent mis­sion to Wash­ing­ton for his Jeep-build­ing com­pa­ny, Joe Fraz­er had arrived one morn­ing in 1943 and parked him­self in Jones’s out­er office, despite repeat­ed warn­ings that the Sec­re­tary wasn’t like­ly to arrive until evening—if at all. Final­ly at 7PM, Jones breezed in, say­ing he was too busy to talk to any­one and head­ing for his pri­vate office. 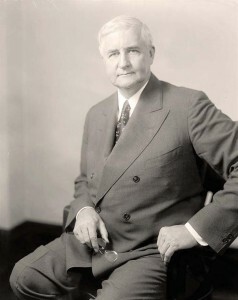 Chrysler VP for Sales Joe Fraz­er, age 42, implor­ing cus­tomers to buy the 1934 Chrysler Air­flow. This proved a dif­fi­cult job. Robust of build with flash­ing blue eyes, Joe Fraz­er was typ­i­cal of the gre­gar­i­ous, hard-dri­ving pro­fes­sion­als who sur­round­ed Wal­ter Chrysler. It is not sur­pris­ing that he flits in and out of his­to­ry, not only of Chrysler Cor­po­ra­tion, but many of the asso­ci­at­ed makes and com­pa­nies now part of Chrysler’s her­itage. —Excerpt­ed from “Chrysler Peo­ple: Joe Fraz­er,” writ­ten for For­ward, the Chrysler his­tor­i­cal mag­a­zine, Sep­tem­ber 2000. 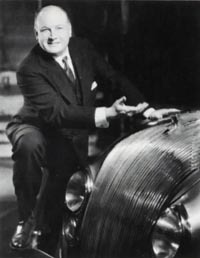 In April 2012, Joseph Wash­ing­ton Fraz­er (1892-1971) will be induct­ed, belat­ed­ly, into the Auto­mo­tive Hall of Fame, with his erst­while part­ner, Hen­ry J. Kaiser, co-founders of the world’s fourth-largest auto man­u­fac­tur­er dur­ing 1946-48. This arti­cle is updat­ed from the obit­u­ar­ies I wrote for JWF on his death in 1971. For more on Fraz­er, see my book, Kaiser-Fraz­er: Last Onslaught on Detroit. Read your Wiki: Jesse Jones was born in Robert­son Coun­ty, Ten­nessee, and didn’t move to Hous­ton until he was 24. Please see your Wikipedia ref­er­ence as Jesse Jones was a Tex­an, Hous­ton­ian real­ly. One of the most pow­er­ful unelect­ed men of the Twen­ti­eth Century…Secretary of Com­merce under Pres­i­dents Wil­son and Roo­sevelt.